As we continue to feature favorites from our national staircase portfolio, our next series of blog posts will highlight beautiful curved staircases designed for sorority homes at universities across the South and Midwest. How do you describe the interior style of sorority homes? Sororities play a large role in many universities, especially those located in southern and midwestern states. Often, the groups have striking homes either on or off their campuses, and we are proud to have partnered with many sororities to enhance their homes with beautiful curved staircases. In sorority home design, elegance is key. With an emphasis on feminine accents and whimsical twists, these chic homes are known for their classic southern charm. Curved staircases are a perfect complement to this style, enhancing elegant gathering areas with their seamless flowing lines and clean curvature. Over the next two blog posts, we will feature five beautiful examples of curved staircases constructed by our expert team. 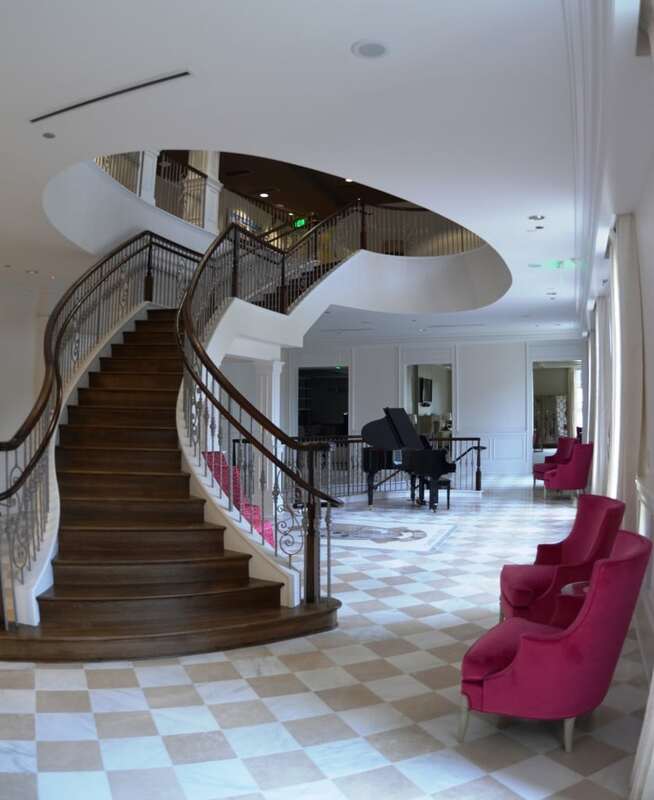 Designed for Greek homes across the nation, each of these curved stairs is a perfect fit for its home and residents. See for yourself! We begin in Tuscaloosa, Alabama with two charming designs at the University of Alabama. Both unique yet elegant, these stunning curved staircases are perfect spots for sorority members to pose for game day photos before cheering on the Crimson Tide. 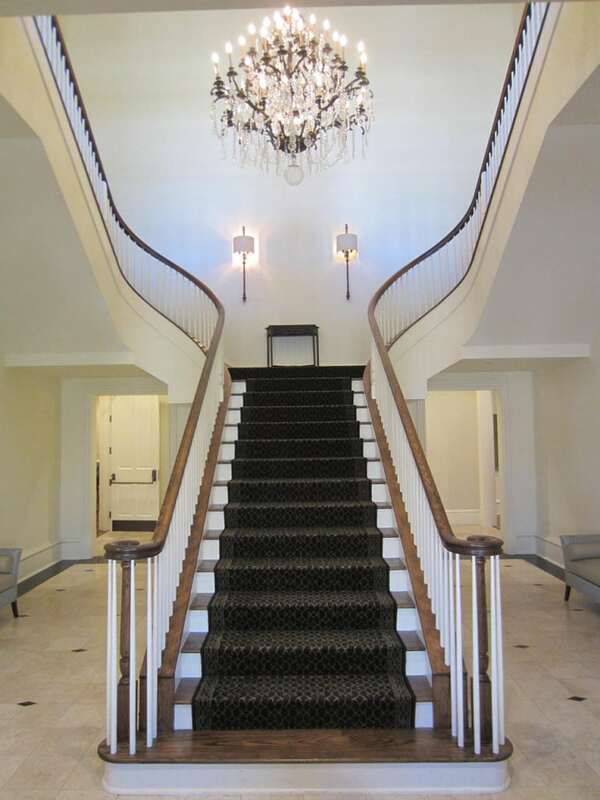 This luxury curbed, freestanding curved stair offers the perfect accent to this University of Alabama sorority home. 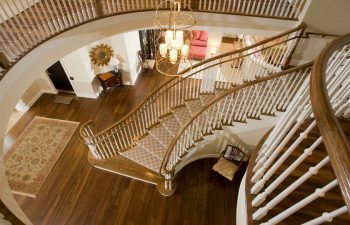 With premium touches including a mahogany Georgian handrail and custom turned newels, this round stair features corresponding stained treads and risers in a rich finish. The baluster system is unique with a knuckle and scroll pattern, while a sleek and hammered powder coated grey finish completes the chic design. Across campus, our team designed another, very different, sorority home staircase. Featuring an elegant straight to curved stair construction, this custom staircase offers clean transitions to the next level on both sides. Our design team created a simple yet luxurious symmetrical design with the goal of beautifully framing the elaborate chandelier in the center of the space. The staircase’s elegant and unique shape is balanced with simple, white wood tapered balusters and a carefully constructed Regency handrail in red oak with plain Charleston newels. Stay tuned for next week when we will visit three additional universities to feature curved staircases in their sorority houses. Our talented team designs, constructs and installs unique residential and commercial staircases across the country. From Beverly Hills to Boston, our team is proud to leave a footprint of quality and perfection upon each site. Visit our product galleries for additional details and pictures on our exquisite projects. From inspiration to installation our team is committed to designing and building the highest quality curved stairs. Our reputation speaks for itself and client satisfaction is our highest priority. Contact us today to discuss your next custom stairs project.